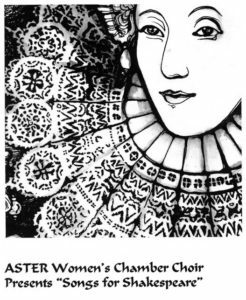 ASTER’s Fall concert Songs for Shakespeare includes choral, small group and solo settings of sonnets and excerpts from plays which have inspired composers through the years. The music of Argento, Beach, Morley, Noble, Quilter, Ratcliff, Sondheim, Young and others will delight your ears with the many different styles they used to set famous texts from A Midsummer Night’s Dream, The Tempest, As You Like It, Much Ado About Nothing, Hamlet and of course The Three Hags Haggis from the Scottish Play. The program is appropriate for ages ten and up. It will be presented without intermission and will last approximately seventy-five minutes. ASTER is pleased to welcome featured guests Grace Asquith and Bonnie Hoffman from Chamber Ensemble con Grazia who will perform excerpts from John Rutter’s Antique Suite for flute and piano on the program. Tickets are available at the door, from choir members or at Brown Paper Tickets. For more information call Christina Lynn-Craig at 303-466-2879. ASTER is an open and affirming organization. We welcome women of all ages, ethnicities, religious and sexual orientations. We have kept our members dues to a minimum so that women of all economic backgrounds will be able to join and have provided financial assistance to women who cannot afford to purchase our concert attire and stipends to women who need assistance to pay for childcare while they are attending rehearsals.